India has always captivated me – be it food, people, culture, nature… And even though I have only had a handful of chances to visit India, every one of these visits left me with many memories, new experiences and emotions. I should probably start by saying most of my close friends are Indian. And they call me their Indian sister. However, I am actually from Ukraine and have no resemblance to an Indian person – apart from in my heart. Sharing the same values when it comes to family and friends is what I believe brings us so close together. 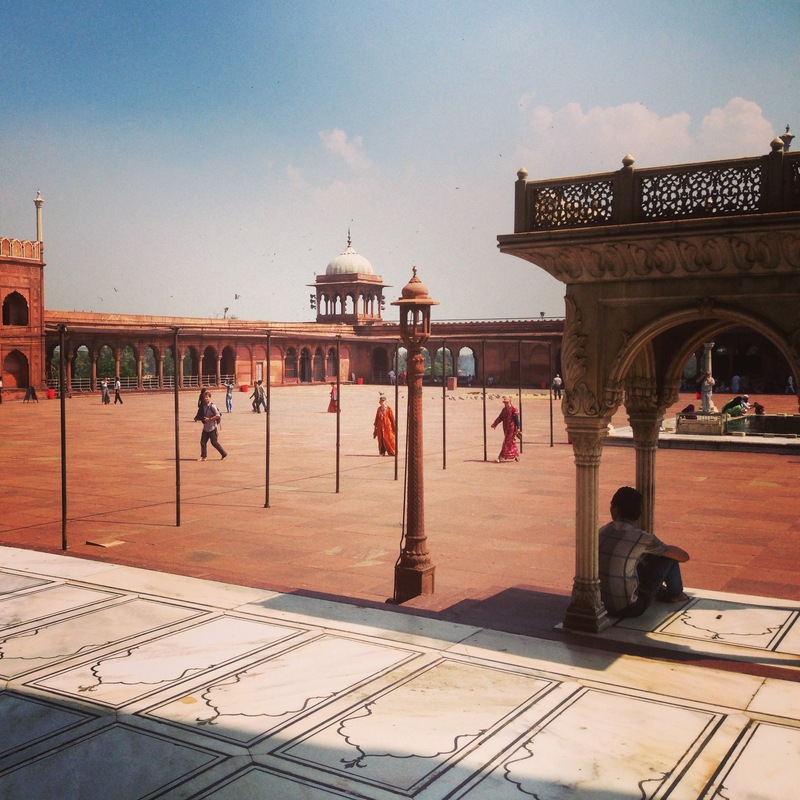 What fascinated me about India is how extreme poverty lives side by side with beautiful thousand year old palaces, grandiose mosques and ancient monuments. 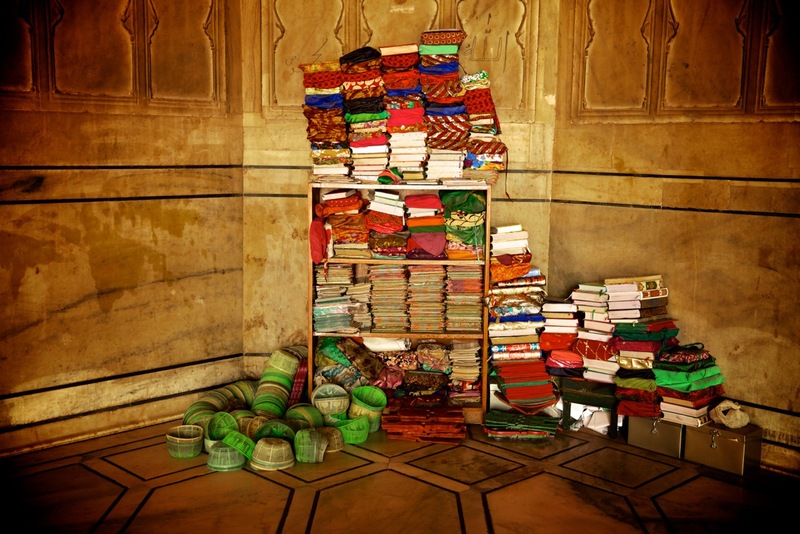 How the colours are not only present at the vibrant local markets, spice stalls and in the local food, but are part of the daily life – whether it is in the vivid rainbow saris, painted rickshaws, flower garlands, throws covering the windows and so on. How every dish – from the simple sliced cucumber dipped in aamchoor (mango powder), cumin and salt to charred tandoori meats and steaming curries – is a feast not only for the stomach, but also for your eyes. 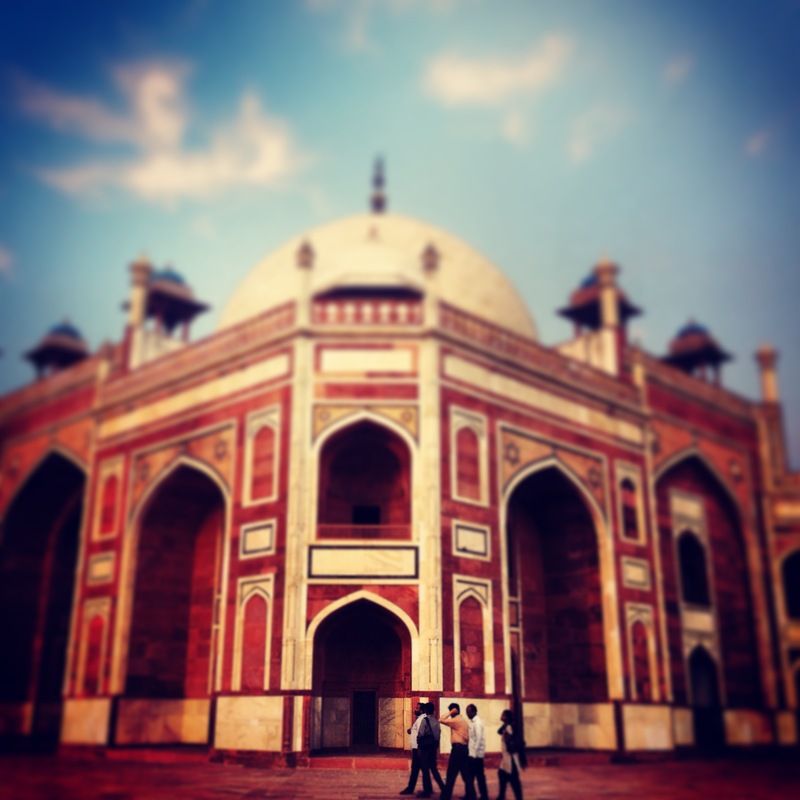 However, India can also be overwhelming with sights, sounds and smells. So, when planning your visit, it is important to have a peaceful place where you can retreat from the ceaseless honking, heat and fumes of the streets to unwind and reflect on your experiences in a serene environment. And the Imperial Hotel in Delhi was just that tranquil place for us. Even though I usually like to start the day early when exploring a new city to avoid both heat and crowds, breakfast at this colonial hotel is such a beautiful experience that you can think of it as part for your Delhi experience and allow plenty of time to enjoy it. Sit on the terrace overlooking the garden and order either aloo paratha or one of the dosas on offer (and, of course, there is also a wide selection of breakfast items on offer from the buffet) and slowly immerse yourself into the Indian life. 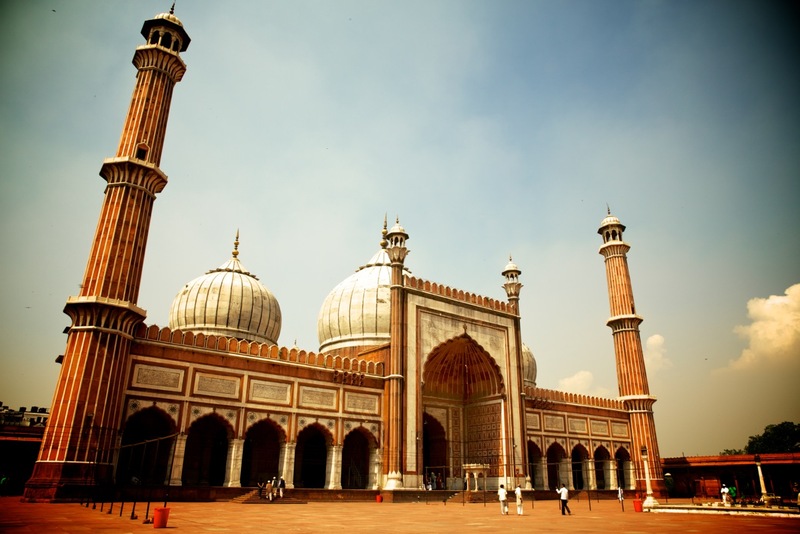 The largest mosque in India – Jama Masjid (also called the Masjid-i Jahanuma, or ‘the mosque commanding a view of the world) – is located in the old Delhi and is not to be missed. What strikes you the most about it as you enter through one of the gateways is not the imposing black and white domes, beautiful red stone arches or Arabic scripts carved into white marble, but it was the immense space that surrounds you once you enter this mosque. 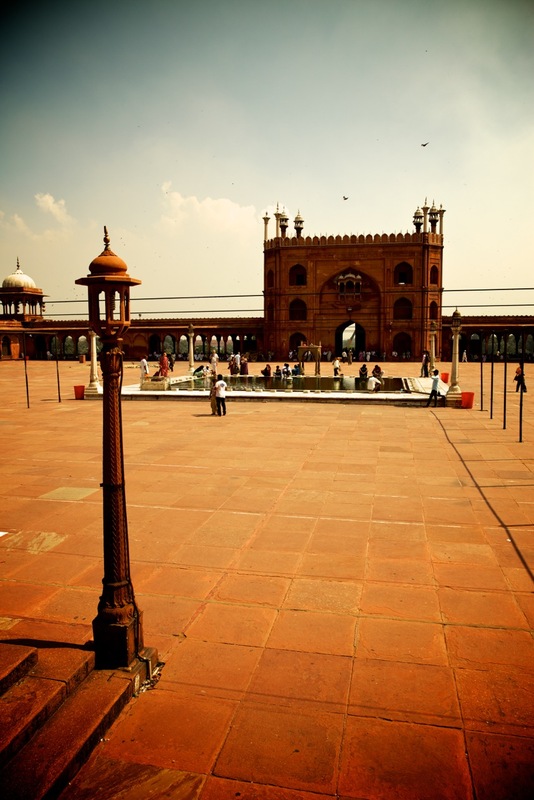 The courtyard inside the mosque – paved with red sandstone, interrupted by white marble strips which mark prayer positions for worshippers (and also provided a welcome relief from the burning of the hot sandstone on our bare feet) – can apparently hold up to 25,000 worshipers*! No wander one feels intimidated by its sheer size! Sitting down in the shade under one of the arches, one can try and take in the sheer enormity of this place – with flocks of pigeons picking on heaps of grain, foreign visitors in colourful robes** tip-toeing on the burning stones of the courtyard, workers setting up red carpets ready for prayer. 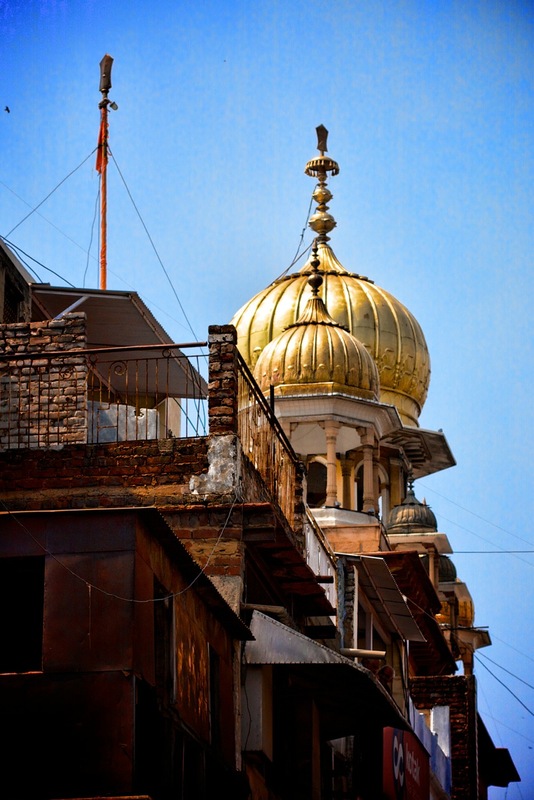 Chandni Chowk – or moonlit square – is just around the corner from Jama Masjid at the centre of the old Delhi. These atmospheric densely populated lanes and bazaars with their old-world charm are best explored on the back of a rickshaw if you are short of time. 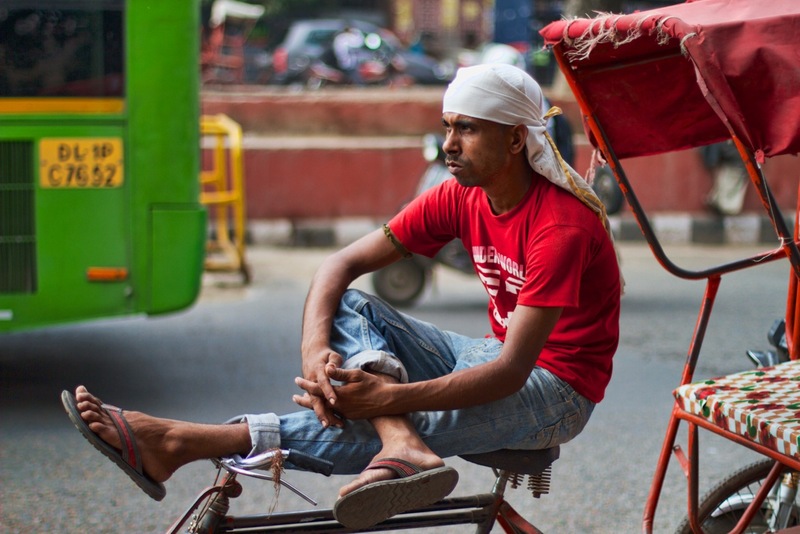 Riding through the winding narrow alleyways of the bazar – with different lanes having different areas of specialisation – is certainly a colourful adventure. 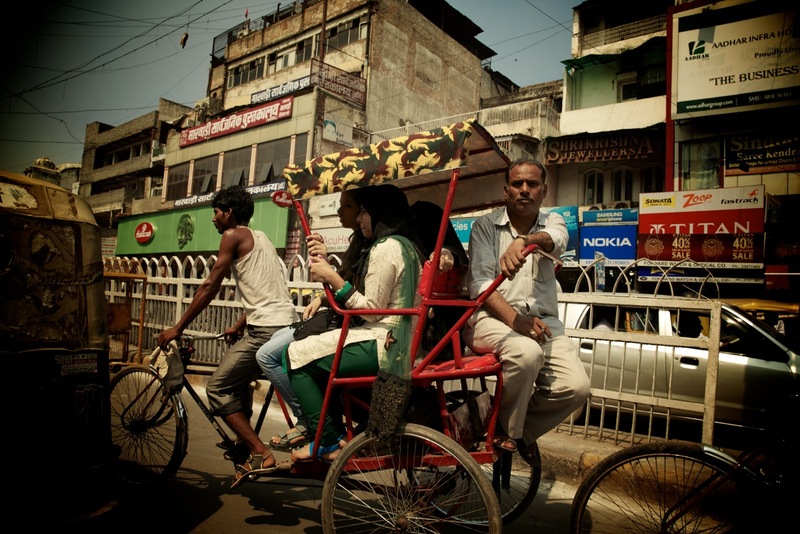 And, apart from getting a glimpse of the buzzing, electric, vibrant environment in this market, you will also feel the rush of adrenalin as the rickshaw squeezes through the smallest gaps between cars, cows and pedestrians as you exit the market and head towards the Red Fort – an imposing 17th century structure that impresses with its greatness. 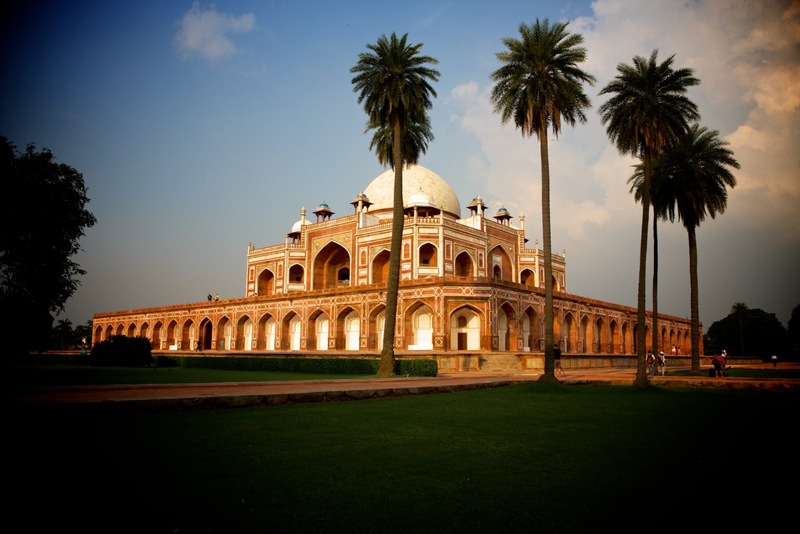 On the other side of town is the Humayun’s Tomb which enchants with its combination of red sandstone and white marble in the setting of vivid green of the surrounding gardens and vivid blue of the sky. 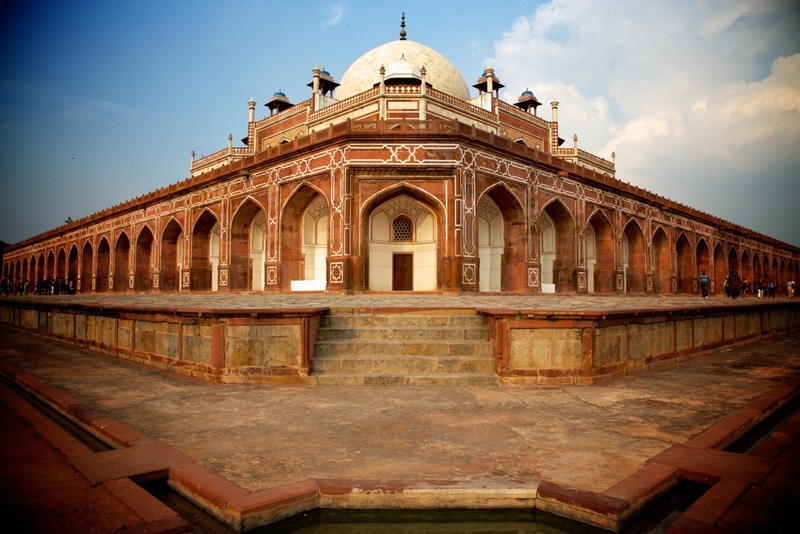 While Humayun was the first to be buried in this Tomb back in 1556, the tomb has now over 100 graves, earning it the name “Dormitory of The Mughals”. 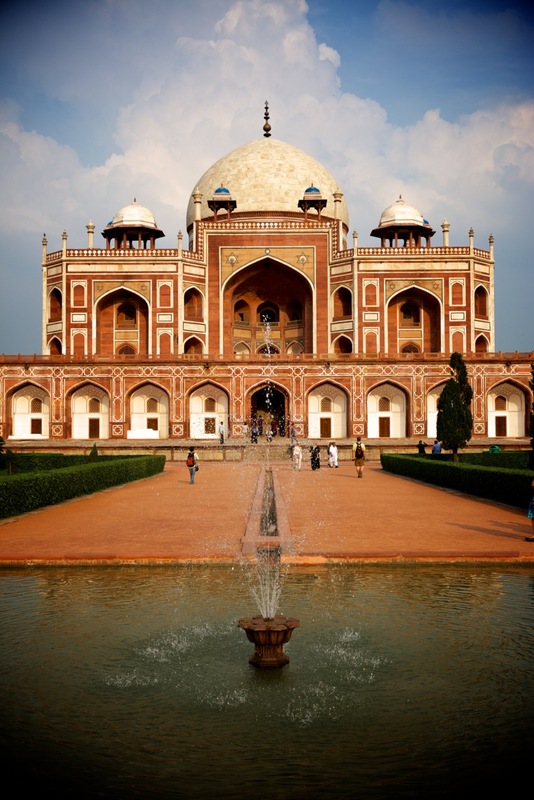 This garden tomb – with its inlaid tile work and carving embodying both Indian and Persian decorative elements – is said to be the first example of the monumental scale that would characterize subsequent Mughal architecture, such as the Taj Mahal in Agra. It is very captivating to see that the craftsmanship one can see in historic buildings can also be found in the modern time and age. And a great example of this is the Akshardham temple*** – a Hindu temple complex that was only opened back in 2005. The large temple crafted entirely of pink sandstone (symbolizing love for God) and Italian Carrara marble (symbolizing purity and peace) boasts delicate ornate carvings of themes from Indian mythology. Carvings and figures are everywhere you look – covering the outside of the temple, on every wall inside and not even a single centimetre of the ceiling is left untouched. And no matter how small the figures are, the carvings have the highest level of detail. Simply magnificent! No trip to India would be complete without an explosion of flavours found in its food. And one of the most satisfying experiences in Delhi was lunch at Lazeez Affaire. While the restaurant setting is nothing to write home about, the food – which is typical of North India – is a different story. The gentle warmth of yellow dahl, delicate melt in your mouth yoghurt kebabs, the freshness and vivid green of palak paneer, beautiful char on the chicken kebabs, speck of dried mint on freshly baked parathas… Oh, and the steam wafting up from vegetable biriyani once the pastry seal on the clay pot is broken. Heavenly! And no Indian meal is complete without mukhwas – a classic after-meal snack in Indian culture, often used to freshen breath and aid digestion. While mukhwas vary in terms of composition and colours, the one that excites me the most is a simple combination of sugar crystals mixed with fennel seeds. 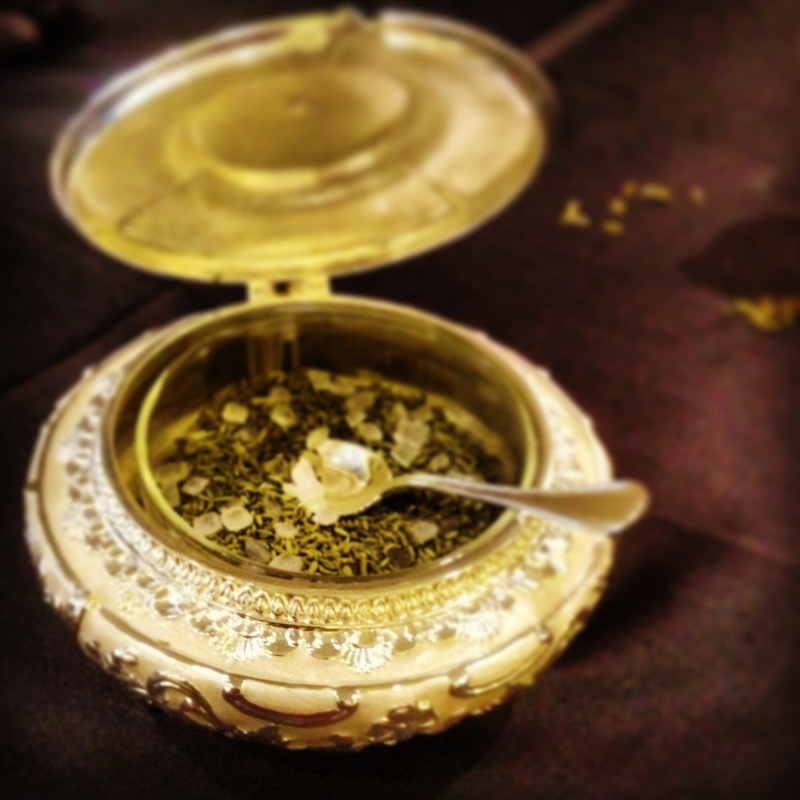 In this case, served in an ornate silver bowl. I would like to finish this narrative with a recipe for one of my favourite Indian infusions. And while not originally from Delhi, it is something that I have discovered while in Delhi (thanks to the lovely owners of the Andraab treasure chest). I am talking about a beautifully golden drink originated in Kashmir. A delicate combination of cinnamon, cardamom and saffron that makes you want to stop the hectic activities of your day and sit back and enjoy a glass of this honey coloured liquid. Let’s call it Kashmir Infusion. 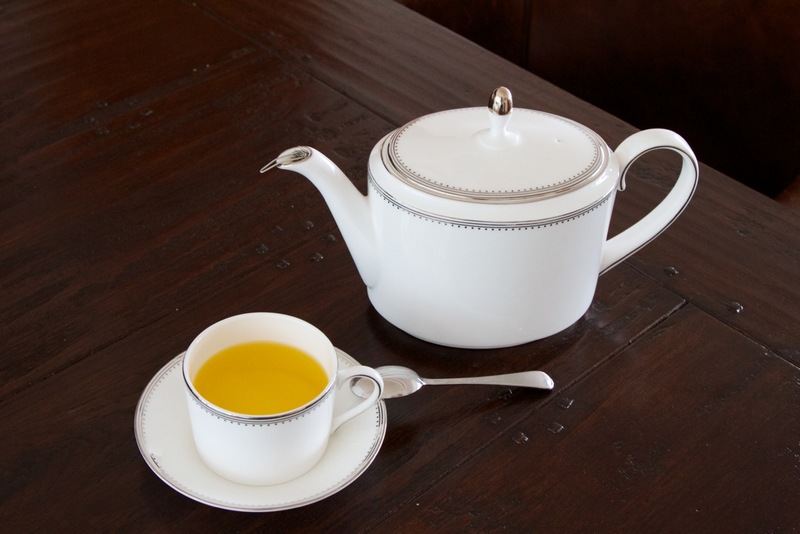 I have made it on numerous occasions after my return from India and every time the delicate flavour and beautiful colours of the drink help me unwind and enjoy the beauty of this aromatic and warming potion. Start by putting a pot of water on to boil with some cinnamon bark and a few crushed cardamom pods. Once boiling, let it sit on a gentle fire to infuse with the warmth of cinnamon and aromatic floral flavours of cardamom. After a few minutes take the pot off the heat and add a few striking red strands of saffron, which gives this infusion such a beautiful golden hue and earthy notes. After you let the saffron sit in the drink for a few minutes, bleeding its golden colour, poor it into a teapot and serve. Sit back and enjoy the magic of this humble, yet so satisfying, drink that helps you slow down and enjoy the simple pleasures in life. 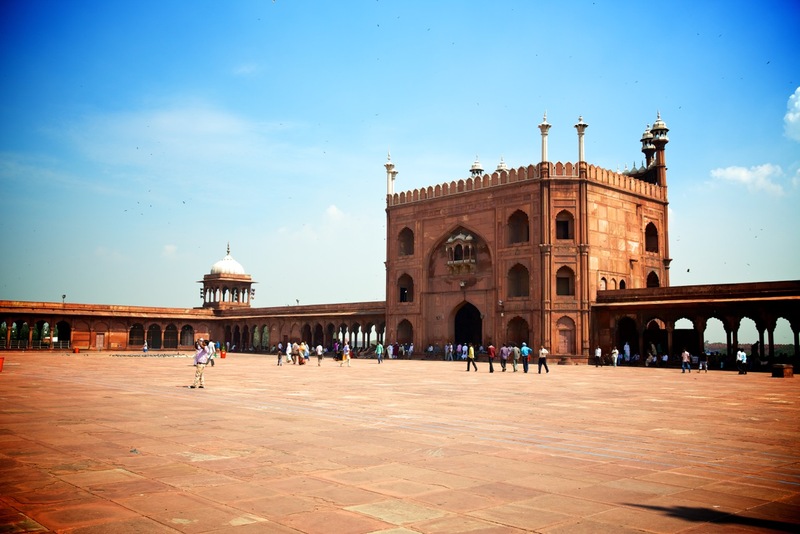 * At the time of its construction, it was the largest mosque in the subcontinent and today it is exceeded in size only by the Friday Mosque of Lahore, Pakistan.